Zhongjie Wang1, Yue Xuan1, Andrew Wisneski1, Danny Dvir2, Jian Ye3, Julius M. Guccione1, Liang Ge1, Elaine E. Tseng1. 1UCSF Medical Center and San Francisco VA Medical Center, San Francisco, CA, USA, 2University of Washington, Seattle, WA, USA, 3St Paul’s Hospital, Vancouve, BC, Canada. OBJECTIVE: Transcatheter aortic valve replacement (TAVR) is established therapy for intermediate-, high- and prohibitive risk patients with severe aortic stenosis, but questions remain regarding long-term durability. Valve design, in particular leaflet stresses impact durability. We have previously determined leaflet stresses for balloon-expandable TAVRs. However, leaflet stresses on self-expanding TAVRs are unknown. 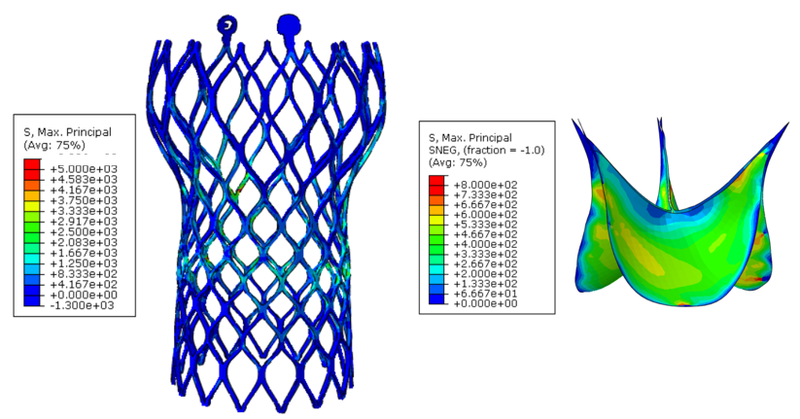 Our goal was to determine and compare leaflet stresses on 26-mm second-generation Medtronic CoreValve Evolut R using finite element analyses. METHODS: Medtronic CoreValve Evolut R TAVR device at size of 26mm underwent high-resolution micro-computed tomography scanning to develop precise 3-dimensional geometry of the leaflets, stent, and polyethylene terephthalate elements. Stent material properties were based on nitinol, whereas those for leaflets were based on published literature of biaxial stretch testing of fixed porcine pericardium. Finite element analyses using ABAQUS (Dassault Systems, Waltham, Mass) was performed with dynamic pressure loading.RESULTS: At 80mmHg, maximum and minimum principal stresses on TAV leaflets were 1.28 MPa and -0.23 MP, respectively. Peak leaflet stresses were observed at commissural tips where leaflets connected to the stent. Maximum and minimum principal stresses 9.01 MPa and -8.91 MPa, respectively, located at stent tips where leaflet commissures were attached. CONCLUSIONS: Stress analysis of the 26-mm Medtronic CoreValve Evolut R valve using exact geometry from high-resolution scans demonstrated that peak maximum and minimum principal stresses for both transcatheter aortic valve stent and leaflets were present at leaflet edge by the commissures where leaflets were attached to the stent. These regions would be most likely to initiate degeneration.